Unless you’re going to be tracking the car most of the time, lap times are pretty pointless and irrelevant, we can all agree on that. We can also agree that there’s no better way of measuring a car’s performance. Speaking of lap times, there’s always been only one lap time which mattered the most: the one at Nurburgring. The 24-odd mile, 154 turn track is highly regarded as one of the most dangerous and exciting on the entire planet. It’s practically a road with amazing sceneries and some barriers to protect onlookers. The surface is rough with lots of crests and dips, there’s basically no run off areas and one small mistake can spell total disaster, yet it’s the place where each and every manufacturer goes to benchmark their new model. For years now, the front-wheel drive performance segment has been mostly dominated by either European or American hot hatchbacks. The Seat Leon Cupra, VW’s Golf GTI and of course, the Focus ST/RS. Now though, the original hot hatchback is back, and boy did it come out swinging. The idea and goals were relatively straightforward from the beginning: dethrone the German-made VW Golf GTI Clubsport Edition. And manage to beat it, it did. The new Honda Civic Type R set a blistering lap time of 7:43.8 seconds, knocking over 3 seconds from the GTI’s lap time. A lot of it is down to the 2.0-liter turbocharged four-cylinder with 306 horsepower, but there’s a lot more to it than just the engine. Although power is still sent to the front wheels alone, Honda has ditched the old and dated torsion beam setup in favor of a new and modern independent multilink one. The tyres are 10mm wider on both ends and it boasts aggressive aero which is actually functional. The car doing the run did wore a full roll cage for safety reasons, so Honda ditched the rear seats and the infotainment system to offset that. They claim the two things completely counteracted each other out in the end. 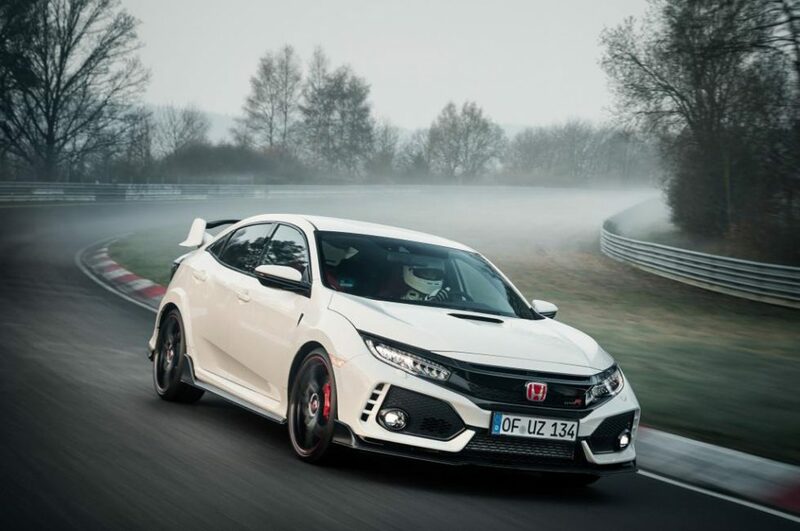 The record-breaker also sat on Michelin Pilot Sport Cup 2s tires, a far cry from the standard Continental Sport Contact 6s fitted to the production Type R. Honda says the sticky Cup tires will be an option which should soon hit dealers, but regardless of that, it was still an impress run.